The rug has been pulled from under the Polisario’s feet in the battle over Guerguarat wherefrom the Algerian-backed separatists had to withdraw in extremis to avoid an outspoken condemnation by the UN Security Council. The adoption of the UN Security Council resolution 2351 last Friday was delayed to allow for the Polisario pullback from the Guerguarat area in the buffer strip on the border crossing with Mauritania. The strip, under the 1991 ceasefire agreement, should remain demilitarized. After months of simmering tension in the border crossing and provocation attempts against the Royal Armed Forces on the other side of the security wall as well as attempts at hindering the flow of commercial traffic between Morocco and West Africa, the Polisario was forced to abide by international law without Morocco firing a single bullet. 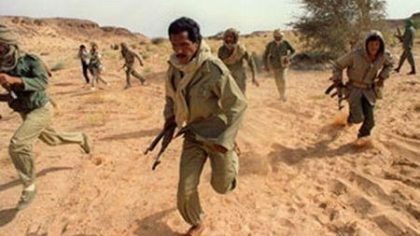 Polisario, which acts upon orders from its paymasters in Algeria, showed strategic short sightedness by maintaining troops in the Guerguarat area, in its desperate attempts to tell the world that it still exists. Previously, polisario officials vowed to never leave the Guerguarat strip in a bid to distract attention from the waning support for their separatist thesis in the continent where an increasing number of African countries back Morocco’s territorial integrity and sovereignty over the Sahara. Also, the Polisario’s provocations by maintaining militiamen in the Guerguarat area aimed at trapping Morocco into a military response. But Morocco’s restraint and attachment to settle the Guerguarat issue through the UN dealt a diplomatic blow to the separatist front, which, now more than ever, is seen by the international community as a source of instability in the region. Securing the Guerguarat crossing is of extreme importance to Morocco, which braces for stronger ties with the rest of Africa, notably after submitting a request to join the West African Economic Community (ECOWAS). Morocco’s Permanent representative to the UN in New York, Ambassador Omar Hilale has made it clear in a statement to the press following the adoption of the UN Security Resolution 2351 that there would be no political process unless the Polisario has withdrawn from Guerguarat.